I sell cakes and other delicious treats from my home for special occasions (birthday cakes, wedding cakes, christening cakes, 21sts, coffee mornings, etc) in Waterford, Ireland (or most locations in the South East). Please click the 'cake' tag below for examples! Contact me at bohokitchen@gmail.com for quotes. We are HSE registered and IOMST insured! I have a degree in Anthropology, so naturally I thought I'd sell cookies and cakes. It's easier than digging up pot shards when you're an attachment parent to two beautiful daughters, Jane (born July 21st, 2007) and Harper (born Oct 31st, 2009). I'm an American ex-pat in Ireland, with my Irish partner Cormac. Zeppe the dog eats the leftovers. I try to share my recipes here on my blog for both sweet and savory treats. Enjoy! Donate to help us in our journey to expand! Or to buy a gift certificate for friends or family. Welcoming a new addition can be so delicious! Okay. I have a confession. With as much as I've baked and cooked I've never made my own pasta. I was intimidated as I have no pasta roller or press. I have made plans to buy the attachment for Big Red (the kitchenaid), and I may well ordered from amazon now to have delivered to the states during our visit (have I mentioned we are about to head off to Florida for a month to visit my family? Sun tan, here we come). I don't even need to write up a recipe, this was so easy. In my case, I added in 1/2 cup of spinach (not per person) and a heavy handed sprinkle of garlic powder. Mix the egg and spinach first, then add your flour. Either use your dough hook or knead by hand into a ball and refrigerate for 30 minutes. Cut the ball in half or thirds, and rolling out the dough (or use your pasta roller, lucky you!). Let it rest for another 30 minutes or so. Then cut into slices. I was impatient and busy baking cookies at the same time, so I just cut it after I rolled it. Then, lay it out to dry for an hour. When you are ready, boil it like you would your dry pasta! It cooks much quicker. Another quickie. I cooked for three people, so I cut one head of garlic in half, chopped off the top end to expose the bulbs, smother in olive oil and wrap tin foil around the bottom. Sick it into a hot oven (200C/400F), and cook until the garlic starts to brown/caramelize. I than squeezed out the cloves into a garlic press and it oozes straight out. I added about 1/2 cup of Parmesan and 1/4 cup milk. 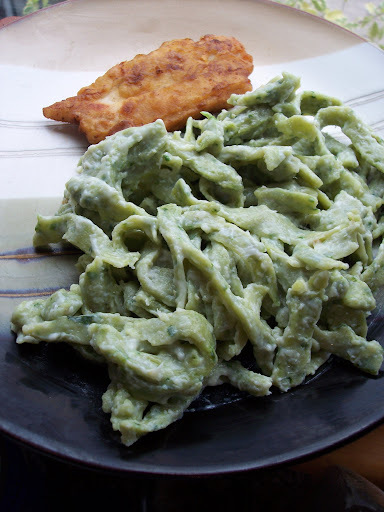 Simple and much healthier than whipping up an Alfredo sauce. I would have loved to have Alfredo, but I thought in combo with the battered chicken I was about to make, I'd take it easy. Now, I use Sunflower Oil. I convince myself this is healthy. I put on about 1/2 cup to heat up in a pan on medium-high heat. I pounded out two chicken breasts and cut them into large pieces. Salt, Pepper, White Pepper the pieces. 1 tsp ground black pepper. Add milk until you get a batter consistency. -Dip the pieces into the batter, and carefully place into the oil once the oil is hot. Cook a few minutes on each side. MAKE SURE the oil is hot BEFORE you put the chicken in. If its not hot, your chicken will be very soggy, nasty and oily. I like to dry freshly fried items on newspaper. This drains the oil out of the chicken like nothing else, and it just tastes crisp.